The African Women’s Decade (2010-2020) was launched in Nairobi, Kenya by the African Union (AU) to re-invigorate commitments for accelerated implementation of gender equality and women’s empowerment. Make Every Woman Count (MEWC), an organization dedicated to promoting the rights and empowerment of African women and girls, publishes an annual report throughout the 10-year duration of the Decade. 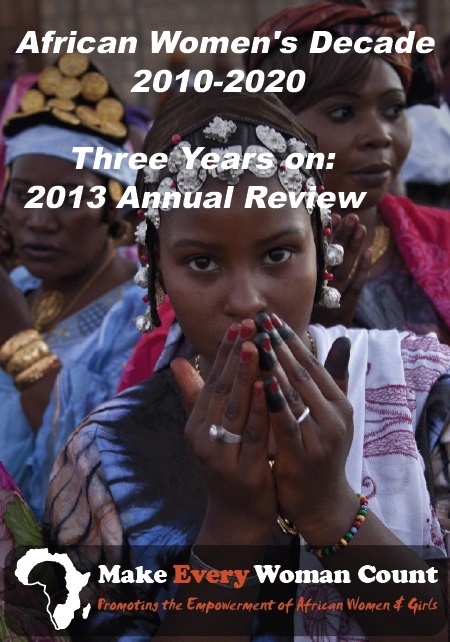 The 2013 annual report highlights the status of women’s rights and marks progress in gender equality in Africa at national, regional and Pan-African levels. The African continent is moving forward with its 2063 vision (an approach to ensure positive socioeconomic transformation within the next 50 years) of full participation of women in their promising future. However, ten years on since the adoption of the Maputo Protocol (Protocol to the African Charter on Human and People’s Rights on the rights of Women in Africa), the voice of African women still remains a whisper. The struggle to gain a fair share of political power and economic opportunities still continues. Women’s bodies are used as a weapon of war, and women are still denied access to health care and education. MEWC presents each African country with a background and a presentation of progress and developments made during the third year of the African Women’s Decade 2013. They evaluate the main gender issues: 1) Economic Empowerment, 2) Education, 3) Gender-Based Violence, 4) Reproductive Health and HIV/AIDS, 5) Women’s Peace and Security, and 6) Women’s Political Participation. Rwanda has the most women in parliament in the world. Women were overwhelmingly voted in September 2013, at 63.75% of Rwanda‘s parliamentary seats (lower house) — an 8% increase from the last elections. As of 2013, 13% of Sudan’s parliament is female, the highest percentage in the country’s history. Algeria became the first state in North Africa to reach the established 30% quota established in the Beijing Platform with a parliament comprised of nearly 31.6% women in 2012. Tanzania is in the process of drafting a new Constitution with aims to increase women’s participation in parliament by having each constituency represented by two Members of Parliament, a female and a male, to ensure gender balance. It will be enacted on April 26, 2014. On the level of local representation of Burkina Faso, the representation of women increased to 35% by 2011 as opposed to just 9.9% in 2002 due to decentralization policies. Comoros, one of Africa’s poorest countries, has one of the lowest percentages of women in parliament at 3.03%. In January 2013, only eight women were elected to a 508 member lower house of parliament in Egypt. In Somalia, despite a 30% quota for parliamentary seats reserved for women, women make up less than 16% of the current parliament. In Zambia, the number of women participating at the local government level has reduced over the years. Current representation is at 6%. In the October 2009 elections in Botswana, out of 117 total candidates, only 10 were women and only two were elected to parliament. It is important to keep track of the progress of African countries towards gender equality. The MEWC report can function not only as a way of monitoring progress achieved, but also as an incentive for countries to improve their efforts in safeguarding the human rights of women and achieving gender equality. “Africa could not yesterday, cannot today and won’t be able tomorrow, to afford the cost of denying the enjoyment, fulfillment and exercise of their full potential to half of its population”.